This fantastic letter, from a new correspondent I met through the Fountain Pen Network (FPN), was so full of interesting beauty that I'm going to have to feature a bunch of photos. 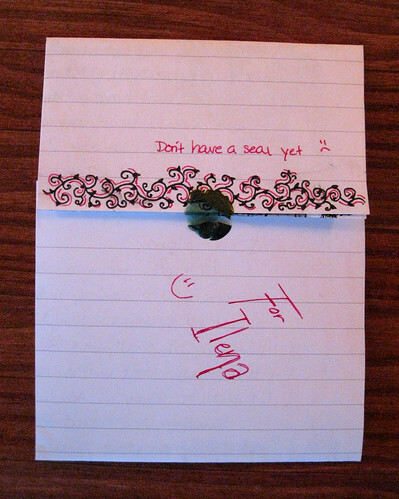 What you see above is what met me when I pulled the letter out of the envelope - sealing wax INSIDE the letter (with her cute note that she doesn't have a seal yet -- but she's got the wax), on the fold, with a beautiful hand-drawn border. Wow! What a detailed and interesting character! My photo, taken in light far too low, doesn't do this justice. There were also all sorts of little spider doodles, which I tried to photograph, but just didn't come out. 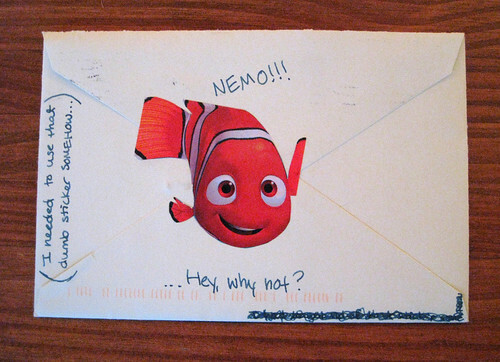 The envelope featured a fun Nemo sticker (I don't think it's dumb! though I've still yet to see the movie) on the back. 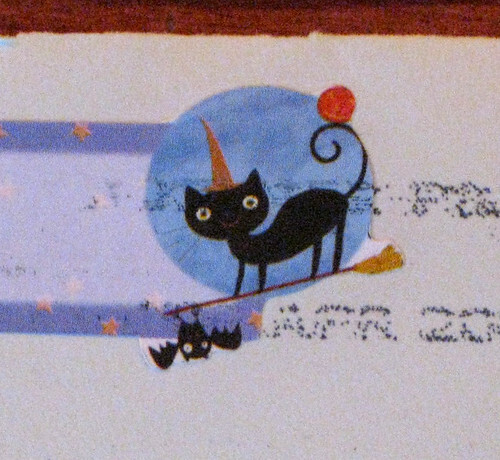 On the front, her return address label had this really quirky-cute witch-cat on broomstick with bat. This one made my day for sure! Oh, and I should mention that it was a really great letter, too. Coming soon, photos of the letter I back sent to her. 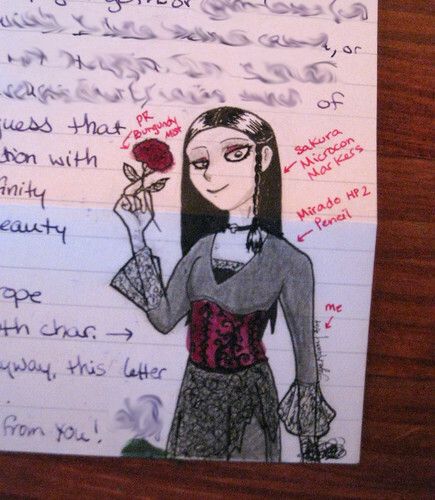 Ohhh what a totally great letter and envelope. What a fun and talented person. Your blog has to be one of the most original blogs out there! I am so charmed with the idea of a space given over to actual letters that I may actually get that letter to my sister written tomorrow when my husband has to be in the office! You're a genius. I'm going to love it here! Thanks so much for your compliments, Lydia. I'm no genius (! ), just someone who was disappointed that there weren't more letter-writing websites out there, and started her own to fill the void. I hope you do write that letter to your sister tomorrow! She will surely appreciate it.